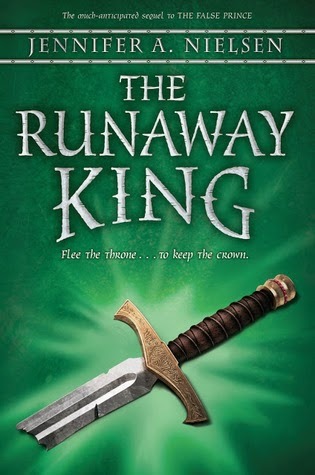 Whitney Award finalist The Runaway King is the sequel to The False Prince, last year's Whitney Award winner for both the 2012 Middle Grade category and the 2012 best youth novel of the year, so it has a lot to live up to. And for the most part, I think it does admirably. Jaron is now on the throne of Carthya, but his troubles are far from over. After an assassination attempt and signs of impending war, he is convinced that his safety and the stability of his realm are not to be found by hiding behind the walls of his castle. So, as the title suggests, Jaron runs away. Well, not so much "away" as "toward a very dangerous situation that has only the teensiest chance of success, which is, however, more than any of the other options." King Vargan of the neighboring kingdom Avenia is a threat and has recruited the notorious Avenian pirates, the same ones charged with the previous unsuccessful attempt on Jaron's life, to ensure his takeover of Carthya. Jaron's regents want to appease their enemies rather than follow Jaron's plan to fight, and propose basically dethroning him, having Jaron go into hiding and installing a steward to rule in Jaron's place until he comes of age. With few loyal and supportive friends in court, especially after sending Imogen away and alienating Amarinda, Jaron decides to take matters into his own hands and goes undercover with thieves on the Carthian/Avenian border and then the pirates themselves. Nielsen writes tension and suspense with deft skill. The stakes are high, but believable. As a middle grade book, you can be pretty sure that all will turn out okay in the end, but I've been impressed with how well Nielsen keeps me right on the edge of uncertainty. I also appreciate her varied characterization. Of course, there are some characters that are pretty thoroughly evil and some that are pretty thoroughly good, but there are also several in the middle gray area that surprise you. Thieves with integrity, pirates with honor, regents without either. There was one major shift in a character that stretches credulity, but I think Nielsen sells it well, and even uses it to good effect in the final installment of the trilogy. She also allows Jaron to grow and mature. It's easy to forget how young he is to be under such enormous pressure until his immaturity and recklessness shines through. Fortunately, he's surrounded by characters who are willing to provide counsel and support, and he is willing to learn from them. Of course, as the middle of three books, The Runaway King lacks real resolution, but it sets the scene perfectly for The Shadow Throne (which, fortunately, my library already had, so I didn't have to wait before diving directly in! ).